It’s the beginning of summer. You and your child are starting to enjoy the season. You’re relaxing school-year routines. You’re having fun. You’re also heedful of the need to keep little brains active and learning in the summer. You plan on encouraging him to keep up his reading, writing, math, and vocabulary skills with creative and fun activities. But there’s also a tiny voice in the back of your mind that worries about his math grade or his difficulty in settling down in the evening to get his homework done. Maybe he’s even said he’s not “getting” long division, or upcoming algebra is scary. When kids tell us they need help we should listen, even if they don’t use direct language. Being able to tell when your child needs a tutor is not always easy, so we must be alert. Ultimate Guide to Summer Learning. Here are ten reasons why summer’s a perfect time to work with a tutor. There’s so much free time in the summer. Face it, even if you’re filling your days with worthwhile activities there comes a day when even the most motivated kids will plead boredom. A little structured time – two hours a week, say – can be just what the doctor ordered. It works. There’s no question, tutoring works. Every kid needs some help from time to time. Working with a caring, competent, and strategic tutor can give yours the leg up he needs. It raises confidence. Athletes, musicians, actors, scholars all know this. A little tutoring time in the summer gives kids the practice they need to make their school skills second-nature. Knowing how three-digit multiplication works, where that pesky apostrophe goes, or when to make an educated guess on a multiple choice test raises confidence. Can you think of a better investment? Yes, you’ll spend some money on a tutor, but you’ll be hard pressed to find a longer-lasting value. Giving kids the skills they need for school success will justify the expense every time report cards come around or when homework time becomes quietly routine. It improves study habits. Sometimes kids need tutoring not in academic subjects but in academic habits. Study skills can almost always be improved. Time management. Test Prep. Organization. Study habits. Note taking. Listening skills. A tutor will help. It strengthens skills. A kid’s skills are going to become stronger when she knows a tutor is going to assess her needs and then work on the areas that need strengthening. Spelling is a problem? The tutor will help her learn ways to study more effectively and to remember spelling rules. It prepares for school in the fall. They won’t admit it, but kids are thinking about the new school year all summer. Help them be prepared for it, especially if you suspect an area that needs some special focus. The more things you can scratch off the Worry List, the better. It helps you set goals for the year. Together, you and your child should set goals each school year. For some kids, more frequently. If you’ve been working with a tutor all summer on reading skills, for instance, those reading skills make for ideal goals. Maybe it’s math, or study skills, or getting organized. Use the summer tutoring experience to set the stage for fall success. It puts you and your child in charge. Nothing’s worse for a kid than to feel he’s losing control of his learning. Nothing but a downward slide from that point on. Getting some tutoring puts him in charge of his learning, gives him the bold assurance of tackling a challenge, and his gratified victory when he’s back on track. It shows your value for learning. We adults can give no better gift to our children than the blessing of coming from a family that values education. When we get a chance to live our values, how can we not jump at it? Summer tutoring. It’s not too late. 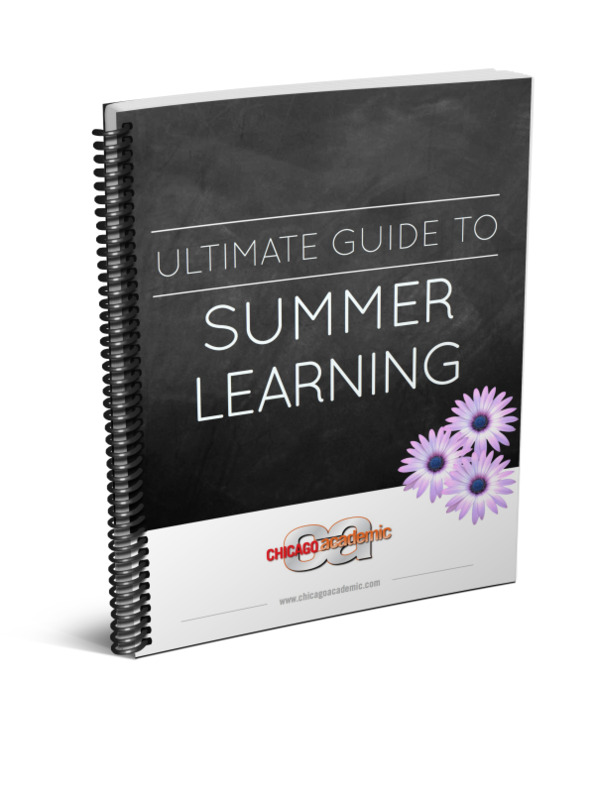 Download Chicago Academic's Ultimate Guide to Summer Learning.